Copyright: © 2017 Marrache M, et al. This is an open-access article distributed under the terms of the Creative Commons Attribution License, which permits unrestricted use, distribution, and reproduction in any medium, provided the original author and source are credited. The long-head of the biceps (LHB) has been reported to be a significant source of pain in the shoulder. Pathology in the LHB can occur independently, but is often associated with other pathologies in the shoulder involving the labrum or rotator cuff. Management of LHB pathology involves tenotomy or tenodesis of the LHB into the proximal humerus. Several techniques for tenodesis have been described, including soft tissue tenodesis, bone tunnels, interference screws, suspensory fixation, or anchor fixation. Subpectoral biceps tenodesis (SPBT) was initially described by Mazzoca et al. . Since the initial report, this procedure has gained popularity because of its relative ease, secure fixation, decreased risk for revision, and minimal complications [2,3]. Humeral integrity may be compromised due to the size of the hole for the tenodesis screw used for fixation. Recently, several authors have reported cases of humeral diaphyseal fractures after subpectoral biceps tenodesis, some of which did not involve major trauma [4-7]. We report on a technique for SBPT using an all-suture anchor (Y-knot, ConMed Linvatec, Largo, FL) performed on a cadaveric specimen provided from ConMed in Largo, Florida. The anchor drill size is 1.8 mm, and has a biomechanical profile which allows its use in SBPT. This technique may offer the advantages of a tenodesis in a subpectoral position, without creating a significant increase in stress on the proximal humeral diaphysis. Shoulder arthroscopy is typically performed in the beach-chair position. An 18-guage needle is used to pass a size 0 prolene suture through the intra-articular portion of the LHB. The prolene suture limb that was passed through the LHB is retrieved from the anterior portal, and both limbs are tagged using a hemostat anteriorly. Shoulder arthroscopy is performed in a routine manner, and fluid is exsanguinated from the shoulder before turning our attention to the SBPT portion of the case. The arm is initially placed in adduction and neutral rotation. The inferior border of the pectoralis major (PM) is identified. A 1 cm incision lateral to the axilla fold is made, extending 3 cm distal to the inferior border of the PM. The PM is encountered running horizontally at the superior portion of the incision, while the biceps and coracobrachialis are identified with their fibers running vertically inferior to the PM. The fascia is incised longitudinally. At this point, the arm is brought into 60 degrees of abduction. Blunt finger dissection under the PM is employed, and a pointed Hohmann retractor is placed inferior to the PM, superior to the LHB, retracting it in a superolateral direction. A medial retractor is not necessary because the arm is placed in abduction. The LHB of the biceps is identified in its course underneath the PM. The tension of the LHB is noted at this point. The proximal hemostat and the prolene suture are now removed, and the long head of the biceps can be retrieved with a 90º hemostat wrapping underneath it. This is done in a medial to lateral position, to avoid any damage to the musculocutaneous nerve on the undersurface of the short head of the biceps medially. A periosteal elevator is used to make a 2 × 1 cm window on humeral surface. A ¼ inch osteotome is used to create ridges on the bone surface, in an effort to promote bony healing of the tenodesis site. The drill sleeve is introduced, and a 1.8 mm hole with the anchor drill bit is placed in the proximal aspect of the periosteal window (Figure 1). Figure 1: A 1.8 mm drill is created in the proximal periosteal window for the anchor. The musculocutaneous (*) nerve is seen in immediate proximity medially. The all-suture anchor is then inserted through the sleeve (Figure 2). Figure 2: The all-suture anchor is inserted. The 2 non-absorbable sutures are passed through the LHB in a lasso loop configuration as described by Lafosse. Tension is assessed prior to tying the sutures down, and if needed, can be re-adjusted (Figure 3). The proximal tendon is excised. The wound is irrigated, and skin is closed using standard techniques. Figure 3: Pre-tensioned all-suture anchor through LHB. The musculocutaneous (*) nerve is seen in immediate proximity medially. 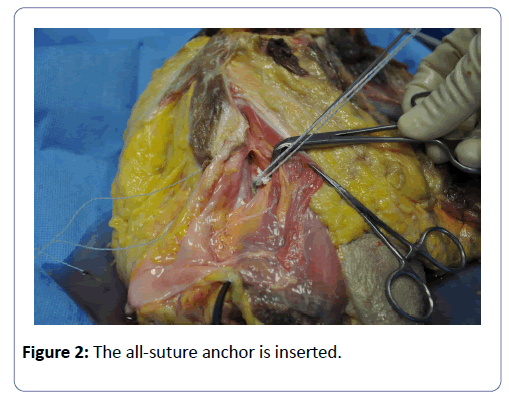 This article is one of the first reports in the literature on performing a subpectoral biceps tenodesis using an all-suture anchor and no bone tunnels. The procedure offers several advantages including a safe dissection zone, a small bony tunnel, and adequate fixation strength. Tenodesis of the biceps in the subpectoral position offers several advantages over tenodesis in the supra-pectoral region. Tenodesis in the supra-pectoral position may lead to persistent symptoms requiring revision surgery in up to 23% of cases . This is predominantly attributed to hidden lesions in the biceps that are not identified during the arthroscopic portion of the procedure. In one study by Moon et al. 70% of all LHB tendons had a diseased tendon that extended into the distal 1/3 of the biceps . Incision for a SPBT was initially described with the arm in internal rotation. However, there have been several reports of musculocutaneous nerve injury with this technique, which prompted the experimentation with new positions to identify the optimal arm rotation for safe insertion of the SPBT [10-12]. 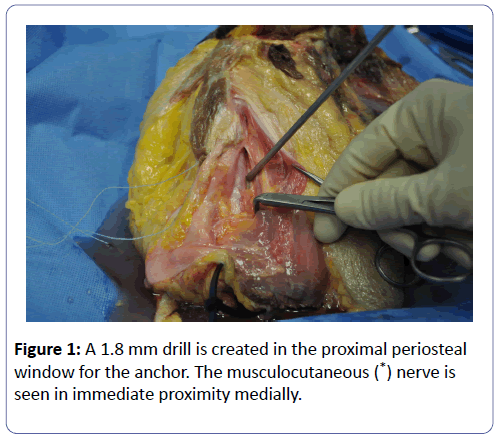 Variations of the musculocutaneous nerve position relative to the tenodesis site have been studied, comparing the distance between the structures with the arm placed in internal, neutral, and external rotation. Rhee et al. revealed that placing the arm in internal rotation brought the nerve closest to the tenodesis site (8.1 ± 3.3 mm), while external rotation of the arm moved the nerve away (19.4 ± 8.2 mm) . They also found that the use of medial retractor placed it within 3 mm of the musculocutaneous nerve, which may account for traction injuries with overzealous retraction. In an effort to minimize these risks, this new technique proposes an incision and dissection with the arm in external rotation, and 60º of abduction. We do not advocate placing a medial retractor. Instead, placing the arm in abduction will allow for gravity to retract the medial tissues inferiorly. There are several reports in the literature of humeral fractures subsequent to SPBT [4,6,7]. The major concern for humeral fracture is the size of the hole created for the SPBT relative to the humeral diameter. The average diameter of the upper third of the humeral diaphysis measures about 19 ± 2.1 mm . When using a 6.5 mm tenodesis screw, which corresponds to 1/3 of the humeral diameter, significant reduction in the torsional strength of the humerus is to expected . Even though the hole is filled with a biotenodesis screw and the tendon of the long head of the biceps, the torsional strength remains weaker by 30% than an unprepared humerus . This effect on torsional strength is further accentuated by the eccentric placement of the hole, which is more common with larger hole sizes . This may help explain the case of a post-operative humeral fracture sustained during a baseball pitch 10 months after the original surgery where the patient did not sustain any trauma or fall. The patient had been cleared to resume full activity and participation in sports . To avoid such complications, we advocate using the smallest possible anchor that allows adequate fixation of the LHB into the humerus (Figure 4A). 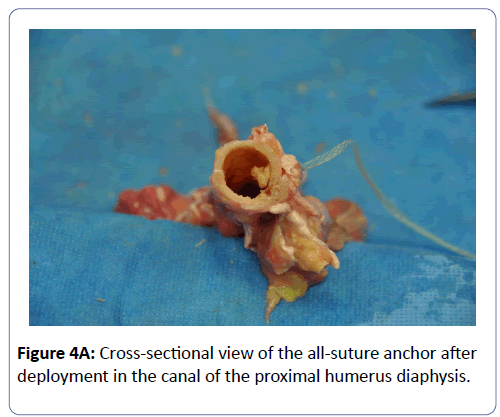 Figure 4A: Cross-sectional view of the all-suture anchor after deployment in the canal of the proximal humerus diaphysis. The initial report by Mazzocca advocated using an 8 mm interference screw as the preferred method of fixation . The reason cited in the initial report was to allow for the strongest fixation possible. The biomechanical strength of this method has been compared to different fixation options, including cortical button, bone tunnels, and suture anchors, which all achieved comparable results [17,18]. One study by Patzer et al. showed that the modified lasso-loop with suture anchor provides tendon fixation sufficient and comparable to biotenodesis screw fixation . In this study, a 5.5 mm anchor was used, which may still account for a significant humeral stress. In order to avoid such tension on the humerus, we advocate using an all-suture anchor with smaller drill diameter (1.8 mm), and comparable biomechanical profile to other anchors . Using this technique, the size of the defect in the humerus is less than 10% of the humeral diameter, leading to minimal reduction in torsional strength, even with its eccentric placement (Figure 4B). Furthermore, there has been no clinical difference in outcomes of SPBT when performed using interference screws or suture anchor fixation . 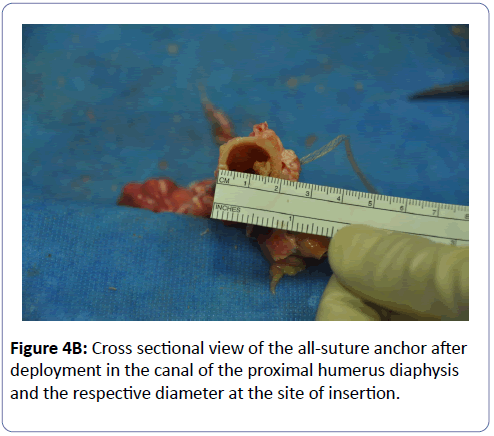 Figure 4B: Cross sectional view of the all-suture anchor after deployment in the canal of the proximal humerus diaphysis and the respective diameter at the site of insertion. We report on using an all-suture anchor with a modified SPBT technique in an effort to decrease the incidence of complications of the procedure. Our modifications allow for safe dissection avoiding at-risk neurovascular structures, a smaller anchor size, adequate fixation strength, and the ability to re-adjust the tension of the LHB prior to tying down the knots on the anchor. Further research should be aimed at biomechanical comparison of this technique, as well as clinical comparison against other fixation techniques, before possible application on humans. Mazzocca AD, Rios CG, Romeo AA, Arciero RA (2005) Subpectoral biceps tenodesis with interference screw fixation. Arthroscopy 21: 896-896.e7. Mazzocca AD, Cote MP, Arciero CL (2008) Clinical outcomes after subpectoral biceps tenodesis with an interference screw. Am J Sports Med 36: 1922-1929. Nho SJ, Reiff SN, Verma NN (2010) Complications associated with subpectoral biceps tenodesis: Low rates of incidence following surgery. Journal of Shoulder and Elbow Surgery 19: 764-768. Beason DP, Shah JP, Duckett JW (2015) Torsional Fracture of the Humerus after Subpectoral Biceps Tenodesis with an Interference Screw: A Biomechanical Cadaveric Study. Clin Biomech (Bristol, Avon). Dein EJ, Huri G, Gordon JC, McFarland EG (2014) A humerus fracture in a baseball pitcher after biceps tenodesis. Am J Sports Med 42: 877-879. Mellano C, Shin JJ, Mascarenhas R (2015) Effect of Biceps Tenodesis Using PEEK Screw on the Torsional Strength of Humerus Biomechanical Study. Orthopaedic Journal of Sports Medicine 3: 2325967115S00026. Sears BW, Spencer EE, Getz CL (2011) Humeral fracture following subpectoral biceps tenodesis in 2 active, healthy patients. J Shoulder Elbow Surg 20: e7-11. Sanders B, Lavery KP, Pennington S, Warner JJP (2012) Clinical success of biceps tenodesis with and without release of the transverse humeral ligament. J Shoulder Elbow Surg 21: 66-71. Moon SC, Cho NS, Rhee YG (2015) Analysis of “hidden lesions” of the extra-articular biceps after subpectoral biceps tenodesis: the subpectoral portion as the optimal tenodesis site. Am J Sports Med 43: 63-68. Dickens JF, Kilcoyne KG, Tintle SM (2012) Subpectoral biceps tenodesis: an anatomic study and evaluation of at-risk structures. Am J Sports Med 40: 2337-2341. Ma H, Van Heest A, Glisson C, Patel S (2009) Musculocutaneous nerve entrapment: an unusual complication after biceps tenodesis. Am J Sports Med 37: 2467-2469. McCormick F, Nwachukwu BU, Solomon D, Dewing C, Golijanin P, et al. (2014) The efficacy of biceps tenodesis in the treatment of failed superior labral anterior posterior repairs. Am J Sports Med 42: 820-825. Rhee PC, Spinner RJ, Bishop AT, Shin AY (2013) Iatrogenic Brachial Plexus Injuries Associated With Open Subpectoral Biceps Tenodesis. Am J Sports Med 41: 2048-2053. Singh A, Nagar M, Kumar A (2014) An Anthropometric study of the Humerus in Adults. Research and Reviews: Journal of Medical and Health Sciences 3. Edgerton BC, An KN, Morrey BF (1990) Torsional strength reduction due to cortical defects in bone. J Orthop Res 8: 851-855. Euler SA, Smith SD, Williams BT (2015) Biomechanical analysis of subpectoral biceps tenodesis: effect of screw malpositioning on proximal humeral strength. Am J Sports Med 43: 69-74. Arora AS, Singh A, Koonce RC (2013) Biomechanical evaluation of a unicortical button versus interference screw for subpectoral biceps tenodesis. Arthroscopy 29: 638-644. Patzer T, Santo G, Olender GD (2012) Suprapectoral or subpectoral position for biceps tenodesis: biomechanical comparison of four different techniques in both positions. J Shoulder Elbow Surg 21: 116-125. Patzer T, Rundic JM, Bobrowitsch E, Olender GD, Hurschler C, et al. (2011) Biomechanical comparison of arthroscopically performable techniques for suprapectoral biceps tenodesis. Arthroscopy 27: 1036-1047. Dwyer T, Willett TL, Dold AP, Petrera M, Wasserstein D, et al. (2013) Maximum load to failure and tensile displacement of an all-suture glenoid anchor compared with a screw-in glenoid anchor. Knee Surg Sports Traumatol Arthrosc 1-8. Millett PJ, Sanders B, Gobezie R, Braun S, Warner JJP, et al. (2008) Interference Screw vs. Suture Anchor Fixation for Open Subpectoral Biceps Tenodesis: Does it Matter? BMC Musculoskeletal Disorders 9:121.